Note: We have pictures of some of these projects available for you to view in the shop. 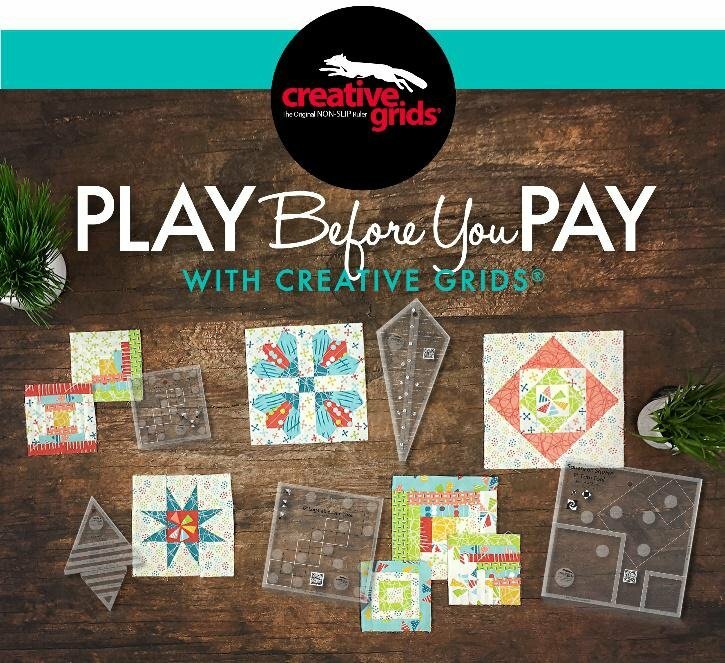 Join us for an action packed “Play before you Pay Creative Grids® event. All rulers and fabrics are provided so you can make four to five different blocks – and learn additional techniques – in a fun and easy class. Create blocks that include fudge factors so beginners to experts can sew them in a matter of minutes. Make perfect “Log Cabin” blocks by trimming each round as you go. Learn how to sew star blocks with floating points – and never cut a triangle. Create “Square on Square” blocks in two sizes from one tool. And, finally, sew a twelve petal Dresden Plate block and learn how to “separate” it to create even more design possibilities. Note: This quilt also uses the four-inch log cabin – #CGRJAWMN4 and the Round Up Tool – #CGRATK1. Materials Included: Cutting mats, rulers, pencils and fabric kits. Requirements: Bring a sewing machine with a 1/4" foot and nutral thread, a rotary cuttern and basic sewing supplies. Since you will be sewing short seams, sharing a machine with a friend is not a problem. Mats, rulers, pencils and fabric kits are provided at the demo stations. You may bring a portable iron and Ironing mat to use at your machine.